And a big squishy welcome to the first Ink & Thimble blog post.. This little pocket of blog space will be a once monthly round-up of Ink & Thimble going-ons, what colours & textures I’m inspired by, as well as inspiration from the past inspired by a chosen theme. The theme for this month (& a big part of my life) is Making Waves. But, as this is my first ever blog post, I thought I’d do a quick intro and sum up of what Ink & Thimble is about. Ink & Thimble is a wedding stationery & embroidery service. I create bespoke paper and textile goods for whatever purpose you desire - whether that’s hand brushed lettering for name cards, or embroidering a piglet onto a handkerchief. Ink & Thimble does not look sideways and is somewhat unfazed by trends & themes seen on social media. My personal pledge is to create one-off bespoke paper or textile goods that celebrate good old individual human beings (& occasionally pets). I will do another blog post soon about how I came to start up Ink & Thimble, and my journey previous to this in a seperate blog post (because it’ll be a lotta blah’ing) - but for now lets keep things light(ish), turquoise, and wavy baby. The ‘Ink’ part of Ink & Thimble represents inks, paints, brush pens, coloured pencils, anything medium I can get my hands on to create art on paper. Here are some recent examples of waves and the sea that have appeared in my artwork. I’m forever trying to capture the sea, something I only thought was previously possible with the use of a massive art space (gargantuan canvas), mess making & a whole lotta oil paint (we’ll get to this). Before the oil painting, ;lets get our illustration on with these two recent pieces. The first was created using a range of mediums, starting with watercolour, added to with oil pastel and then finished with coloured pencil & white gouache. The second is made using just watercolour & coloured pencils, with hand brushed lettering in gouache paint. One of my favourite things about embroidery is the fact I can take it with me anywhere. September & October last year me and Ed went on a van trip to France & Spain to climb and spend time by the sea. 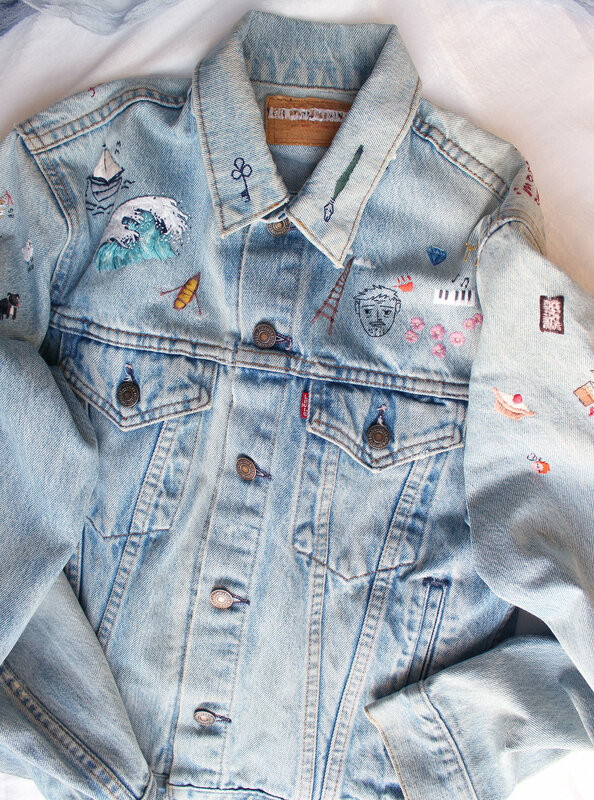 My older (& wiser) sister was having her 30th birthday & I wanted to create something special for her - so I bought a vintage Levi’s denim jacket and pledged to embroider 30 things for 30 on it. Embroidery, though 100% worth it, is one of the most pain-staking crafts I enjoy doing. An entire painting can be completed in a day, but embroidering one wave can easily take a week. So, safe to say this September ‘birthday’ present slowly evolved into a Christmas present. Being close to the sea, I was inspired to embroider a wave - in the style of the Great Wave painting of Hokusai. This embroidery is easily my favourite one on the jacket. I used 3 variations of blues, I feel the navy for the deep shadows works particularly well. Like all of my embroideries I use single thickness thread which, despite being time consuming, creates a finer and more detailed piece. The most satisfying bit of this piece is the little French knot wave splashes. Though these are not part of the original painting, I commonly use French knots in this way and wanted to have some ownership of the piece (and its really fun to do). The rest of the jacket is available to view on my personal illustration website here. This massive canvas is almost my height (so I’m like 5’3” but whatever its big okay). Using wide brushes, palette knives and occasionally my hands, I thickly applied oil paint to create an abstract seascape. I wanted to create the colours, textures, and expressive nature of the sea that makes me feel clean on the inside of my brain. I bought this canvas during a wobbly self-acceptance time and let it gather dust for over 3 years before I completed this seascape in 2015. 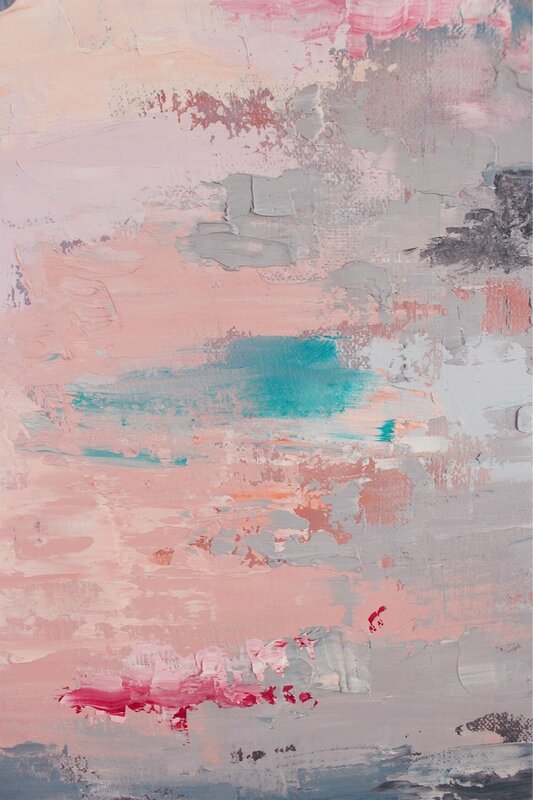 In these three wobble-years, the canvas was subject to some dodgy first attempts, paint-overs, resentment, and was then turned to face the wall. Three years of this blank monster taking up space in my attic room and then, suddenly, a completed painting in three days. Colour, expression, personality. I was 25 years old when I completed this, and going through my children’s nursing training degree. At the time of painting, this canvas represented my own mini Everest - & with every heavy stroke I was climbing it. I don’t know whether a greater sense of self-acceptance is something that became more present in my later twenties, through studying a nursing degree, having two sensationally supportive sisters, or just hard work. But, what I do know, is universally at some stage we all have our own mini Everests to climb. Sometimes you have to go through rubbish times where canvases get dusty to appreciate how proud you are to see them hanging up on your wall one day. SO I guess this should be more of a precursor to the fact that the ‘Making Waves’ colour palette is more of JB’s just general obsession with making the colour turquoise. I recently bought myself a ‘proper’ set of artist watercolours, yanno upping that professional game and all that. And as much as you need to know how to use watercolours properly and be adept with paintbrush skillz (it’s not all about the top notch supplies), I’ve never made such a beautiful turquoise colour in my whole LIFE! Babe I invested in like actual artist watercolour. I know I’m alive when I make turquoise - It makes me smile without fail. I know mixing green and blue will make it - it never doesn’t. I know it’s coming but I get excited and then it happens and it’s the best thing that ever happens. If you’ve never heard of Scrimshaw and how it was one of the most insanely romantic forms of craft in the whole of maritime history prepare yourself. Okay so picture the scene, your partner is away on a long and dangerous trip and you have no contact with them. After years of them being away, you have no idea where they are, what they are doing or if they will ever return. Then one day they return home with a special gift. You open the gift and you smile, because you’ve just got the most beautiful and thoughtful item you’ve ever received. A piece of whale bone you’re expected to wear as underwear. You are loved. Hang on - Whale bone? Undies? Yup! But not any old piece of old whale bone but a polished, engraved strip of Whale bone, or Baleen, that has been individually decorated just for you. 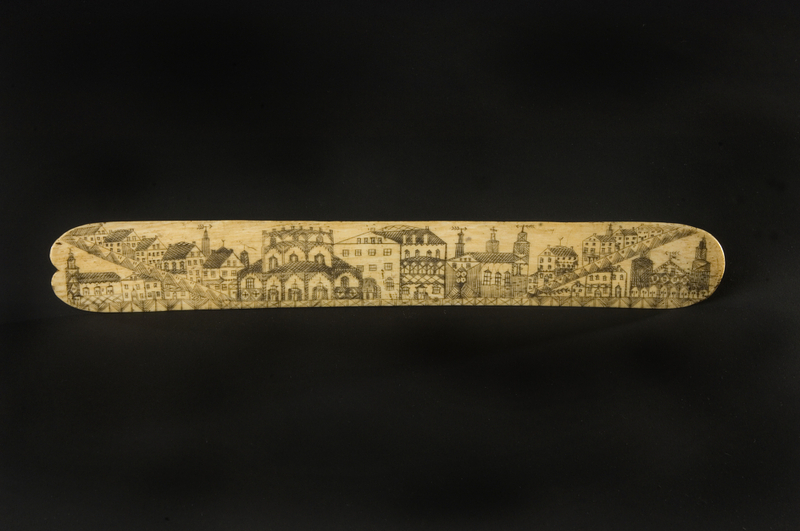 Scrimshaw began in the late 18th century as the art of carving whale bone and ivory aboard whale ships. The whaling crew (I hope they got custom tees with this on) had a lot of thumb-twiddle time between sighting and chasing whales and whalebone stocks were readily available on these long voyages. Often filled with long periods of inactivity, a voyage could last up to FOUR years! So get your needles out boys, and start etching onto these whale teeth! (Actual quote from the Captain). In short, a piece of whale bone would be cleaned and sanded until it was smooth, and then a design was etched into its surface using a fine needle. Once the engraving was complete, the lines were filled with lamp black (residual soot from burning oil) or sometimes coloured pigments. Often used to make functional household items (e.g. napkin rings), they were more intimately used as corset ribbing. Long flat pieces of whalebone, or busks, were slipped into the central vertical pocket in a ladies’ corset to stiffen the garment. These intimate pieces were uniquely carved for their one sweetheart, who would then wear it as a memento of her beloved’s feelings. Okay sure it’s not very vegan and it might seem a bit gross if you think about it a little too much but the dedication, craft & gesture that is represented here blows my tiny land locked mind. Scrimshaw-ly that’s worth a mention (SORRY HAD TO). In all seriousness though, is this not a beautiful comment on what we can achieve creatively when we have limited resources, rare distractions, and a big old dose of love-based motivation. If you have any enquiries about anything you’d read in this blog r.e art., illustration or embroidery commissions (including massive oil paintings) feel free to holla at me via my contact page or directly at julia@inkthimble.com. & if you made it to the end of this blog, you’re a big old sweetheart.